Today I was reading Gizmag and saw a familiar name. The story was about a Hanebrink electric bike set up to pull a golf bag. Weird. Ugly. The current Hanebrink bike has been around in a non-electric version for quite sometime. They pop up in cycling related media every now and then, and each time they do, I can’t believe anyone would buy one. They appear terribly impractical and ugly, although after riding a Surly Pugsley I have to say that big tires don’t slow you down like you’d expect they might. What this article really inspired me to write about isn’t the current Hanebrink bike, but a really old one. As many of my generation who grew up in the suburbs riding bikes likely remember, Dan Hanebrink designed a bike for Hutch that was an early iteration of the HPV genre (thats Human Powered Vehicle.. not Human Papillomavirus!) 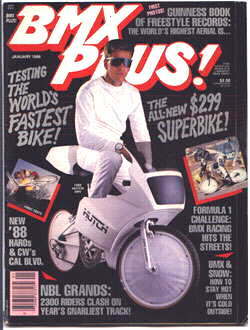 seen here on the cover of BMX PLUS magazine. I remember thinking that this bike was so cool. In reality, I have no idea what I would have done with it. 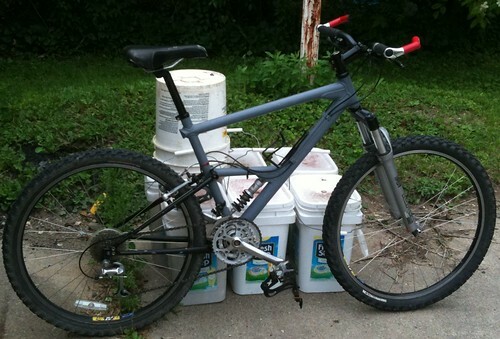 Even now, I’d probably only ride it down Kerber hill a few times and then go park it in the garage. At the time, I had no idea that gravity sports existed. In fact, I think my first awareness of such things were from the slew of “extreme” MTV programming in the early 00’s which sometimes featured stuff like street luge. In the past few years I’ve become aware of collegiate HPV competitions and Mountain bike downhill as well. It strikes me as interesting that this guy was working on this kind of stuff in the 80’s, and skirting the mainstream with it. He also competed in fuel efficiency competitions in the 80’s. Some of the designs surely must have been heavily borrowed for modern vehicles of this type. It really doesn’t seem dated at all. In the past weeks I’ve been working on track racing. I’d never done any of it before, but I decided to give it a go both because our team will be doing track events this year, and also because the cadence style is more like BMX, which I enjoy. For those not in the know, the difference between track riding and road riding is fairly substantial. The bikes are similar to road bikes in shape, with slightly different geometry and one, fixed gear ratio. 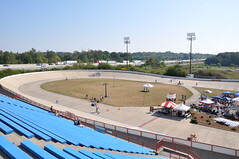 Our home track is Major Taylor Velodrome in Indianapolis, as seen above. As a rule, beginning riders have to go through three hours of track training that the velodrome is offering as “Track 101” classes. I did the classes in two Thursday night sessions. The first was mostly terminology and technology, with a little riding to get used to the track and the bikes. The second was all riding, practicing pacelines and moving around on the track. After my classes, I am now legal to ride some of the track events. I decided to do a time trial saturday, figuring it would be good for experience, and a good baseline for training. I went with Mendoza and rode a bike he loaned me. It’s a custom made Landshark. It’s not carbon, aluminum or anything fancy, but it’s super light and fits me well. It’s also got a pretty sweet paint job – red with green metallic scaled dragons. His coach and team were there so we hung out with them. I think the first real life lesson I learned about track racing is that there is no shade at the velodrome, although I didn’t realize it until later. The Pista Elite/Glacial Energy team had a pop-up tent, but it really wasn’t big enough. I am quite red today. For races, I tried to select a variety, since I didn’t know what I would like or be competent at. I went with the 200m, 1k, and 3k. At the end we decided to try a team sprint. My times all sucked, which is to be expected since this was my first real track outing, however, I am feeling better about the shorter events. At the same time, I prefer the held start of the longer events.. Go figure. I think it’s all mental. I feel a lot stronger taking off from a stop than I do trying to gauge my speed in a flying start. Trying to find a consistent steady state is going to be vital. In the Kilo, I felt like I had a good start, and a good first lap but after the first lap, I was dead tired. I never really thought about how hard it is to push a big gear for any distance. The 3k was much the same, except I paced myself a little better, going easier on the start. I think I liked the team sprint the best of all. I started, so I just had to go one lap with a held start. I screwed up a little because I wasn’t sure what to expect, but overall, I think I did ok, and liked the length. Here are some video examples of what a 200m and Kilo time trials look like. Probably incredibly boring looking to most. I’ll probably be back at the track on the 28th for training night, which will be my first time racing against other people. Should be interesting. In the mean time, I suppose it makes sense to start building. I’d been putting it off to try and get a good base, but since I more or less have to start weight training to get my speed up for the track, I’m going to try and add in intervals and other higher intensity stuff to my other rides.. which also means I need to ditch the diet and start eating a little more. I have a real weakness in my creative endeavors.. It’s originality. It’s not that I’m unoriginal, it’s that I feel like I have to be entirely original. My mind tells me that an idea that’s been done isn’t worth touching. Realistically, I know this isn’t true; almost anything can be improved upon. Regardless, I struggle with this. Along these lines, I’m currently trying to decide what to do about my IBDC project. I spent a few weeks developing an idea, and have been slowly modeling it and working out details only to find that someone has already done something very similar. So I’ve been working on a design for the International Bicycle Design Competition for the past few weeks. My idea targets 3rd world and developing countries by 1. allowing individuals/communities the ability to use this bike to pump/transport water and 2. charge cell phones, as they are becoming more important in lesser developed countries where many people don’t have electricity in their homes. So I work up this idea. It’s a regular bike, with a rack on the back to hold a water tank. the rack can rotate down to form a stand (like a bike trainer) so the bike can be pedaled while stationary. 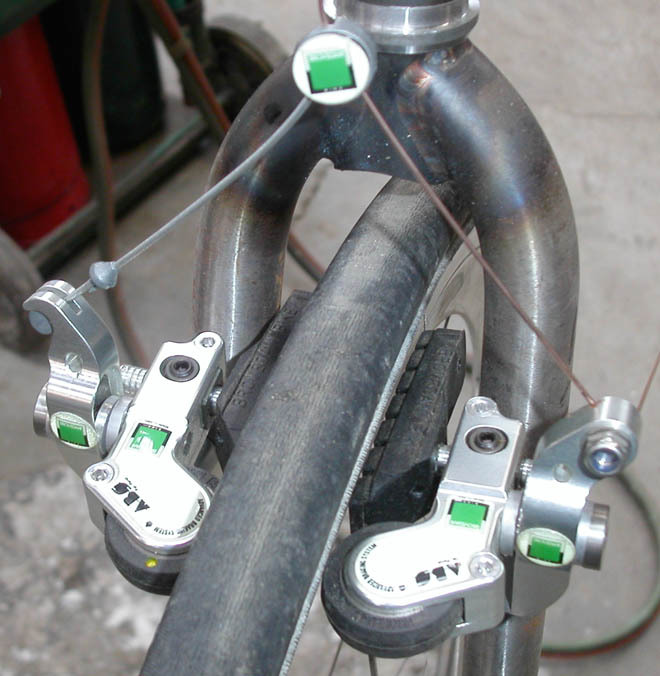 The drive system for the pump and generator run off of a hub mounted disk, not dissimilar to a disk brake. A couple of days ago, I’m googling around for info on pumps and bike parts, and I encounter this project:http://thecoolprojectsite.org/?p=845 (or here for more details on the build: http://www.facebook.com/l.php?u=http%3A … df&h=fc315 ) Basically, it’s the same rotating stand idea. instead of the pump/generator on a ring/pinion drive system, they are run as a traction system from the tire. So now I’m left wondering if it’s above board for me to continue with my project as planned, or scrap it and start over with 6 days before the submission deadline. I really don’t yet understand the social / ethical landscape of design enough to know for sure. I’ve posted the question over at core77, so hopefully I’ll hear back. In the mean time, I’m trying to come up with a new idea that I could knock out quickly. All that said, definitely check out the link to http://www.mayapedal.org. Some really cool and useful projects made from junk. If I wasn’t stuck here, I think it would be a ton of fun to work on this type of stuff for people who could really use it.